Would You Wear an Asymmetrical Wrap Skirt Like Hilary Duff? « Emmy Rossum’s Floral Skirt Ensemble is Good Enough for Work and Play! Hilary Duff is easily one of the most photographed Los Angeles-based celebrities. It’s no surprise that the singer, who just recently released a new single, goes out of her way to dress up. The 26-year-old’s style is pretty eclectic. She can be casual chic one day in her distressed jeans and basic shirt ensemble and stylishly edgy in a floral romper and structured blazer the next. As spectators, it’s fun to wait for what the multi-hyphenated star will come up with next. A few days ago, the Chasing the Sun singer was in the mood for a beach-meets-boho kind of look. Hilary sported what looked like a batik-printed asymmetrical wrap skirt from Helmut Lang. She wore it with a basic black tank top and a pair of Laurence Dacade Pete Leather Ankle Booties. Her choice of accessories is also interesting. Take a look at her necklace that resembles stepping stones. What do you ladies think of her outfit? 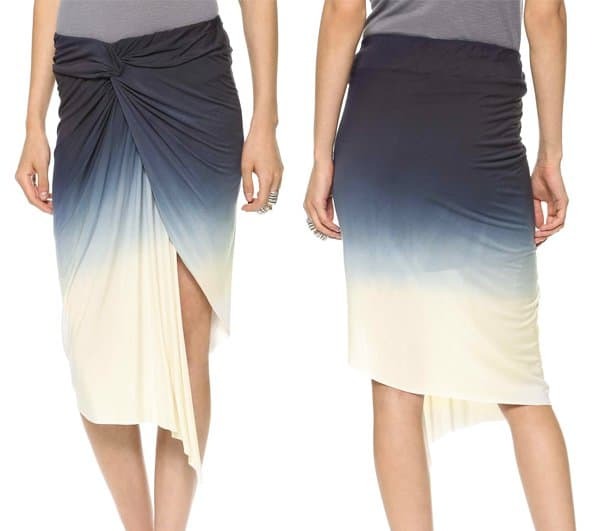 Would you wear a similar pair of asymmetrical wrap skirt the same way in the city or do you think such a skirt is better relegated for the beach?